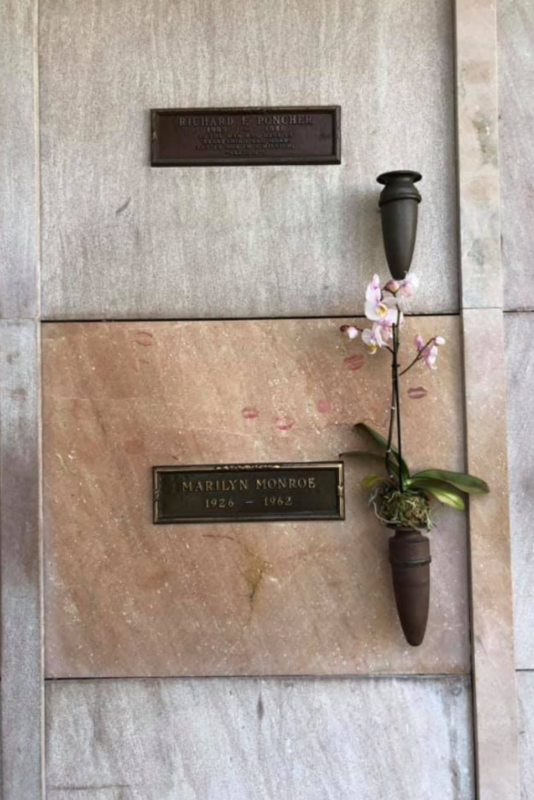 I have wanted to visit Marilyn Monroe’s grave for a long time. One of the main reasons that it took me so long to make it there is the fact that she is buried in Westwood. Several celebrities are buried at Forest Lawn in Glendale or Hollywood Forever. Marilyn Monroe is buried at the Pierce Brothers Westwood Village Memorial Park and Mortuary. This cemetery is tucked away behind some large buildings. It is very easy to miss it. No need to worry about parking on the street and paying. Drive through the gates to the cemetery and you should be able to find parking. It is quite a small area though so no promises. When you first drive in take an immediate left if you can. Go down towards the prayer room and you will find Marilyn’s grave to the left of the room a few slots down. Her spot is more of a pink color which helps it stand out. The kisses also help giveaway which one is hers. Right next to her you will find Hugh Hefner. On my next visit I would like to find Natalie Wood, Dean Martin, Jack Lemon and Don Knotts who are also buried here. Have you ever been to one of Marilyn’s favorite places? She loved the Beverly Hills Hotel. You can read about my experience at the Polo Lounge.